This statistic displays the gross domestic product (GDP) of the Netherlands from 2007 to 2017 (in billion euros, at current prices). It shows that between 2007 and 2017, the Dutch GDP from output increased from roughly 619 billion to 737 billion euros. According to a recent forecast, Dutch GDP will likely continuously increase in the next few years, with an increase of over three percent forecasted for 2017. When looking at the GDP per capita, a similar development is visible. 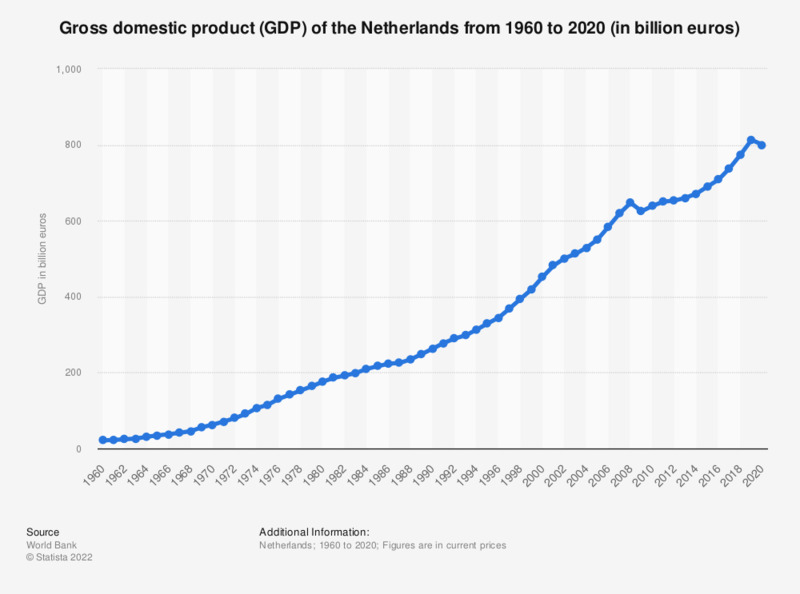 In the last ten years, the GDP per capita increased from roughly 33,400 to 39,900 euros in the Netherlands, an increase of roughly 6,500 euros. A similar development can be seen in neighboring Belgium, which has a slightly lower GDP per capita, as shows this statistic. The annual GDP is the total value of all final goods and services produced in a year. Everything On "Key economic indicators in the Netherlands" in One Document: Edited and Divided into Handy Chapters. Including Detailed References. Statistics on "Key economic indicators in the Benelux"